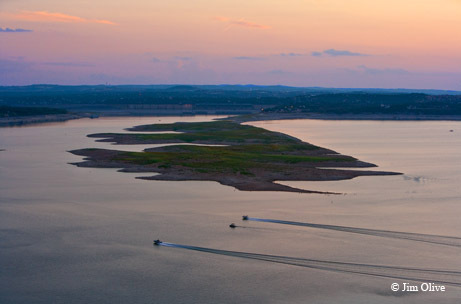 With demands on our lakes increasing, now is the time to take care of future water needs in Texas. 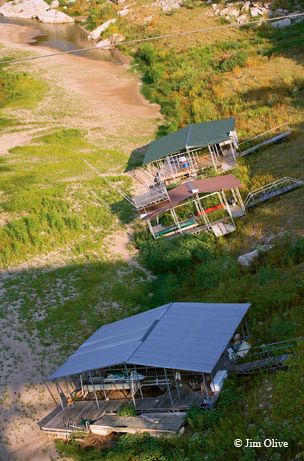 Texans love their lakes, whether they are fishing for the lunker of a lifetime, speeding across the surface propelled by the wind or a herd of gas-fed horses or simply luxuriating in the view of the setting sun from a lakeside campsite, restaurant or home. “At the lake” is where many Texans live on weekends. We boat, swim, camp, paddle, fish, sail, party, bond, laze. We make memories that will last a lifetime. Lakes surprise us with 10-pound bass like the one I caught on Cooper Lake in March, or the serenity of a morning kayak paddle on Caddo Lake like the one my wife and I enjoyed last year. Few living Texans can remember the time when the state was not blessed with a multitude of sparkling lakes. Yet it was not always so, and not so long ago. Responding to the drought of record that bled Texas dry in the 1950s, Texas built reservoirs — to date 196 of them with a surface area of 5,000 acres or more, 175 of which are used for water supply. In ensuing years we have built a great urban civilization that depends on lakes. Yet perhaps because they are so central to the fun parts of our lives, we sometimes take the serious side of lakes for granted. Lakes are water. Water is life. Texas reservoirs and all other sources of water — groundwater, reuse of water, conservation, desalination — already fall short of providing all our water needs during droughts. Right now, if a drought equal to that of the 1950s were to occur, demand for water would far outstrip the supply. And that supply is decreasing. According to Water for Texas: Summary of the 2011 Regional Water Plans, the basis for the 2012 state water plan developed and revised every five years by regional water planning groups and the Texas Water Development Board, existing water supplies are projected to decrease about 10 percent between 2010 and 2060. During the same time period, demand is expected to increase by 22 percent, primarily because of an expected population increase to 46 million people. Reservoir management strategies would have the greatest economic impact on urban areas, except those in the Texas Panhandle, which depend primarily on groundwater from the Ogallala Aquifer. Without additional water, in 2060 the area that includes the Dallas–Fort Worth Metroplex could lose $49 billion in income, $3 billion in state and local taxes, a half-million jobs and three-quarters of a million people and suffer a school enrollment drop of 271,000. Those figures are just for the year 2060 and assume a drought of record. Impacts in previous years would also be severe; estimates are in the 2012 plan. There is no intention among those responsible for planning for Texas water needs and supplying water to allow a statewide version of the disaster that struck the Great Plains late in the 19th century when drought stymied efforts to settle and farm the region, leaving behind what one writer called “a mass of human wreckage in the shape of broken fortunes, deserted farms and ruined homes.” Yet this will happen again unless we act, and act now. Regional water planning groups have been busy seeking to identify their water needs each decade through 2060, ways to meet those needs and the price tag for doing so. The 2007 state water plan estimated the cost at $31 billion; the 2012 version hikes that to $53 billion. Of that $53 billion, half needs to come from local sources and half from the state, and nearly $32 billion of the total needs to be spent in the next 10 years. 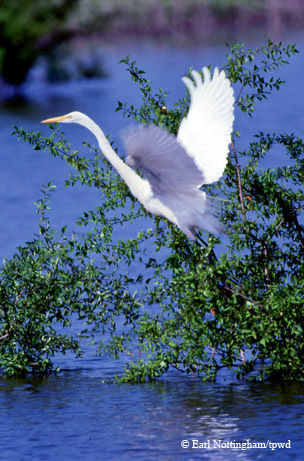 TPWD serves as a nonvoting member on each of the 16 groups, providing input on impacts to fish and wildlife resources. Regional water plans identify a wide range of strategies to meet the demand for water, including 26 new reservoirs (up from 16 in the 2007 plan) to supplement those already existing. Some are “traditional” reservoirs, those that impound a flowing stream. Others are off-channel reservoirs that can be used to hold and store water pumped from a stream in times of high flow, then used when needed. Another option is to increase the conservation capacity of existing reservoirs. Many reservoirs, especially those built by the U.S. Army Corps of Engineers, were built primarily for flood control, and much of their capacity is unused most of the time. The Corps of Engineers and the Brazos River Authority are studying reservoirs in the Brazos River basin to determine if some flood control capacity can be reallocated to conservation, in effect making the lake bigger. While it sounds simple, raising the conservation pool level could mean having to build new boat ramps, raise bridges, move utility lines and possibly modify dams or spillways. Existing reservoirs will continue to be the source of the majority of water, but only if they are maintained. “The long-term issue in reservoir management is sedimentation,” says LCRA’s Wheelock. Sediment washed into reservoirs will eventually harm them. River authorities are helping to fund sediment-reducing land use practices on private lands within watersheds feeding reservoirs. LCRA’s Creekside Conservation Program resulted from a study on how to reduce sedimentation from the Sandy Creek watershed in Gillespie and Llano counties. Our aquifers are still the largest freshwater reservoirs we have, but the science is still developing to measure just how changes in land management practices might affect infiltration of water into the soil and subsequent seepage into aquifers for eventual discharge through springs into streams. Texas Tech University’s Ken Rainwater and his colleagues have been working on a project that may someday be able to help answer that question. Rainwater’s team uses instruments to record changes in water stored in and evaporated from playa lakes and temperature probes at different depths in the soil to measure infiltration rates around playa lakes. They are also working with the Texas State Soil and Water Conservation Board’s water supply enhancement program to study how local applications of brush control can increase stream flow and groundwater storage. The quality of water entering reservoirs is also important and serves as the focus of work by Larry Hauck of Tarleton State University. As water flows across the land or through aquifers, it picks up minerals, nutrients, bacteria and chemicals and carries them with it. Like Rainwater, Hauck is interested in being able to measure what’s happening as a way of evaluating the effectiveness of management practices. In recognition of the importance of managing watersheds, TPWD has set up the Watershed Policy and Management Program within its Inland Fisheries Division. The program’s goals have a direct impact on reservoirs, says Gary Garrett, the senior scientist and program director. “Land management practices reduce erosion and sedimentation, help percolation to feed higher-quality water into streams and reservoirs and keep riparian areas healthy,” he says. “It’s easy to think about reservoirs as not being connected to anything else, but they are. The water quality and quantity of reservoirs as well as sediments are all directly affected by their watersheds." Constructed wetlands along the Trinity River — the George W. Shannon Wetlands Water Reuse Project on TPWD’s Richland Creek Wildlife Management Area near Corsicana and the East Fork Raw Water Supply Project at the John Bunker Sands Wetland Center near Crandall — are emerging as national models for reusing water and dealing with sedimentation and pollution. Water pumped from the Trinity River — which consists largely of return flows from wastewater treatment plants in the Metroplex — circulates through wetlands, which let sediment settle out while aquatic plants gobble up phosphorus and nitrogen, and bacteria on the plants remove harmful chemicals. 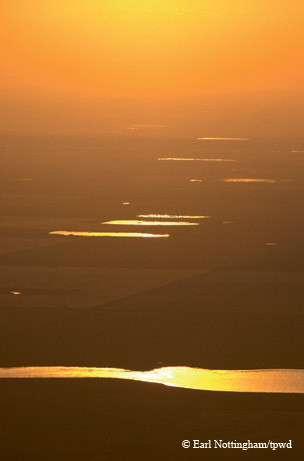 The polished water is then piped to water supply reservoirs, where it begins the cycle anew. “Wetlands are very energy-efficient, because they primarily use the sun’s energy to clean the water,” says Ellen McDonald, a water resources engineer with Alan Plummer Associates, the company that designed the wetlands. “Constructed wetlands are also valuable because of their educational value, creation of additional wildlife habitat and public acceptance of the reused product — people see them more positively than they do a wastewater treatment plant.” Another benefit of water reuse projects is that the footprint on the landscape is minuscule compared to that required for new reservoirs. Supply is one variable in the water equation; conservation is another. All regional water plans depend on conservation to some degree, because saved water is cheap water. In 2009, LCRA estimated that conservation programs cost about $400 an acre-foot for water yielded, while new reservoirs and pipelines cost about $2,000 an acre-foot. The amount of water that regional water plans estimate could be saved through agricultural and municipal conservation is more than the supply that would be generated by construction of the 26 new reservoirs proposed in the 2012 state water plan. Regional water plans are increasingly relying on conservation as a strategy for meeting future water needs, and voluntary conservation in urban areas could play a major role in avoiding the need for expensive new reservoirs. Another challenge facing reservoir operators across the state is the desire of lakeside property owners and recreational users to have lakes maintained at stable levels rather than using the water for the purposes intended when the lakes were constructed. “We have to be visionaries,” adds LCRA’s Wheelock. In the final analysis, that is the challenge facing those charged with supplying Texans with water: envisioning ways to work within legal, environmental, climatic, political and social restraints to keep the water coming. It will keep coming — but only if we make it so, and water will come only in quantities that nature, politics and economics allow. Making the best use of that water is up to each of us.